The Joint Employer Legislation (JEL) isn’t the most thrilling topic you’ll encounter (it probably won’t appear on your list of hobbies anytime soon), but it’s important because the Joint Employer Standard and the current legislations have some big implications for the franchise industry. For operators, it probably feels a little unsettling because frankly, there’s a lot to digest. Franchisors and their legal counsel are likely already sifting through the minutia to formulate a solid plan in the instance that the legislation will pass in July 2016. 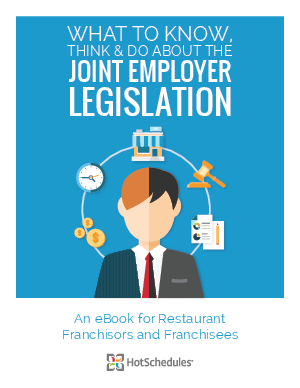 In this eBook, our goal is to help ease some of that uneasiness and help you understand the current and proposed changes to the Joint Employer Standard, who is and could be impacted, the risks to franchisors and franchisees and steps you can take to get ahead of any changes.